You ever have something in your fridge or pantry that’s really old, not very appealing any more, but not nasty enough to just throw away? I have this problem with preserved lemons – not the lemons themselves, I usually use them right up – but the syrup that they come in. Even after the lemons are gone, that juice is still good! But then you forget to use it, and it gets shoved to the back of the fridge, and you feel guilty about it but never quite want to toss the jar and buy a new one…at least that’s what happens to me. 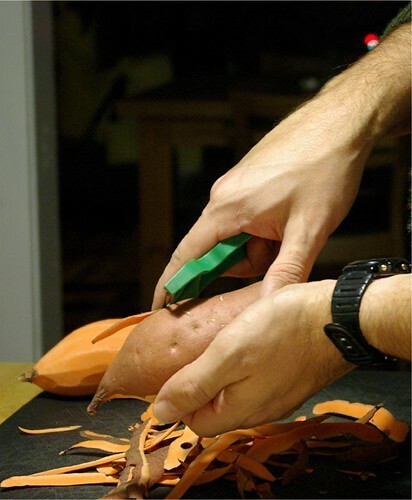 So anyway, I wanted to do roasted sweet potatoes this week, so we went to the store looking for something to go with them. Pork chops sounded nice, and we were suddenly struck by the notion that we could use some of our leftover lemon goo on them! 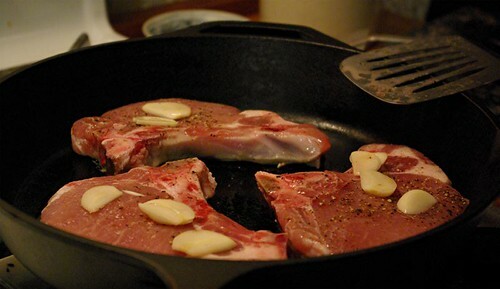 We used to roast pork blade steaks with preserved lemon and garlic, but hadn’t thought of it in a while. I trimmed the fat off the rib chops and tossed them into a zip loc bag with sliced garlic, salt, pepper and a good dollop of preserved lemon juice, and left the bag in the fridge all day. In the evening after work J seared them in the cast iron skillet, covering them for part of the cooking time, then made a pan sauce with chicken broth to take advantage of the lovely fond. 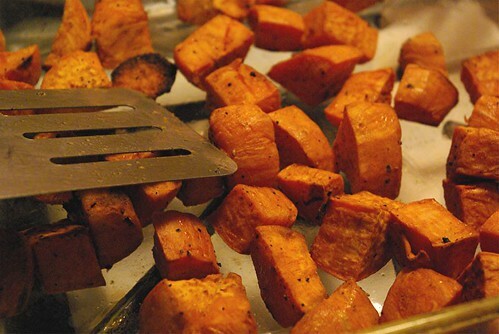 The sweet potatoes were our standard preparation: cut up, tossed with olive oil and coarse salt, and roasted at 400° until soft and buttery on the inside and caramelized on the outside. 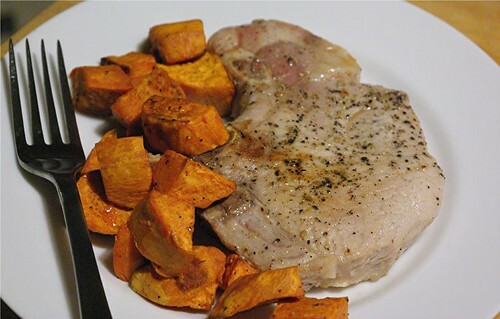 The sweetness of the yams went nicely with the pork, and we added some salad to contrast. The pork itself had a really nice light lemon flavor, and the pan sauce was a great lemony, salty punch drizzled on top. And then there was the wine. 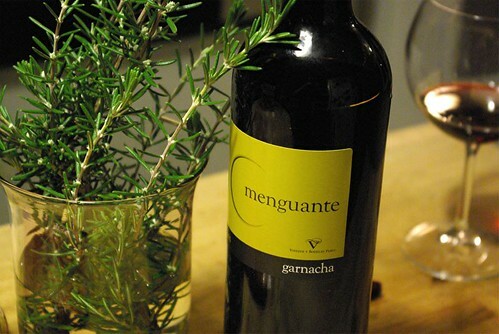 I thought that a garnacha might go really well with the pork and sweet potatoes. I was wrong. It was a nice enough wine, but it just didn’t really stand up to the lemon on the pork and didn’t have enough bottom to support the sweet potatoes’ flavor. Alas. We drank it anyway.